This is an interesting departure for Nathan Edmondson, and in reading the solicitation, and taking a look at what others were saying about this comic book, I think we can all agree that this is a pretty good change of pace for Nathan, and there is some seriously good art from Nic Klein to go along with the comic book. While we are going to have to wait for the full series to come out, this series looks like it is going to be a lot of fun to read, and a lot of fun to get to the ending. With all things that Nathan does, nothing is obvious from the start, and he missed his calling as a mainstream mystery writer, but I am glad that he does this in comic book form. 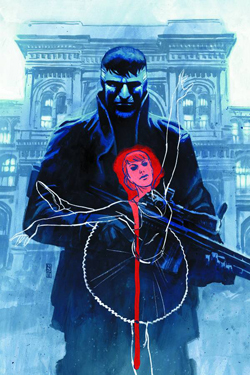 The story line centers on the retired assassin Alan Fisher and his ballerina companion must escape a ruthless sniper who stalks them through the streets of Milan. To survive and protect the love of his life, Alan will unravel the tapestry of the past he’s kept hidden and discover the killer’s impossible identity. What is particularly sweet about this is the ballet throughout the story line, and how it interplays with Alan and his processes of watching the discipline and techniques that make for both an awesome assassin and an awesome ballerina. The opening sequence is all about being at a dinner party that is gunned down, with a nice swap over to the dancer, Quinn and Alan in the seats watching her do her thing. This is a fairly standard start off point, it seems that a lot of dinner parties end up getting gunned down, then break off to something else a little less shocking. But given that we only have a few pages to grab the reader’s attention, then this is where we are going to end up. Given that there seems to be a few dramatic clichés in the comic book, this has ended up being fairly impressive as a read. Nic has also done an awesome job with the art, and the gloomy moodiness of the pages fits in well with the noir feel to the comic book. This is an awesome paring of story line, art, and talent. I hope we see these two teamed up in the future because they work very well with each other in helping the story line along. This comic book is worth the five of five star rating that I am going to give it, dark, moody, gloomy, excellent story line, enjoyable, and entertaining even with the clichés, it is worth getting at your local comic book store. In all this is an excellent team up, and hopefully we will see more of these two telling more stories in the future.